Eighty years ago, Nazi Germany took a fateful step towards the ‘final solution’ to the so-called ‘Jewish question’. Mobs of stormtroopers and civilians launched a night of violence against Jewish property and citizens. It was the turning point when legal harassment of Jews gave way to naked violence. The pogrom was a response to the murder in Paris of a German diplomat, Ernst vom Rath. Ironically, he was a non-Nazi who was under investigation by the authorities for disloyalty. He was shot on 7 November 1938 by a Jewish refugee of Polish roots, Herschel Grynszpan, whose family had been expelled from Germany to Poland. Vom Rath died on 9 November. Coincidentally, 9 November 1938 was being celebrated in Nazi circles, including by Hitler himself, as the 15th anniversary of the Beer Hall Putsch on 8-9 November 1923. That was Hitler’s first attempt to seize power and led to a shamefully weak response: he was briefly jailed before being released to take up again his drive for power which succeeded ten years later. A sad indictment of the failure of authorities to take appropriate action against right-wing insurgents, and an object lesson of what the consequences can be. When the news of Vom Rath’s death reached the party, Hitler left without giving his planned speech. His propaganda chief Goebbels gave it for him, and then announced that if demonstrations broke out, they would not be hampered. That was an instruction to turn for revenge against the Jewish community. During the night of 9-10 November 1938, some 7500 Jewish businesses had their shopfronts destroyed. 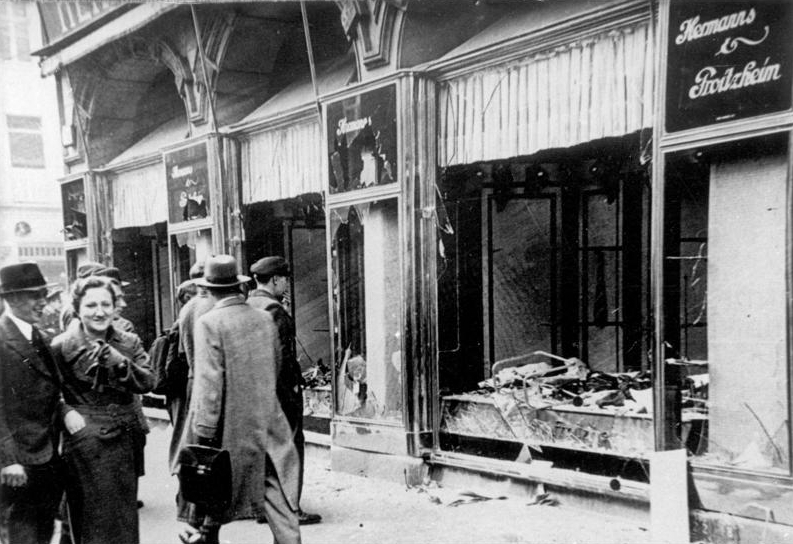 The shards of glass on the pavements gave the attack its name, ‘Kristallnacht’, crystal night. 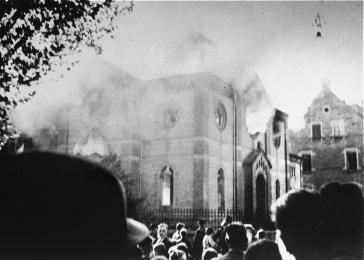 Jewish homes were looted, more than 7000 businesses were attacked and in many cases destroyed, and 1400 synagogues suffered the same fate. The number of immediate Jewish deaths may not have been exceptionally high – perhaps a few hundred including those who died in the following days – but 30,000 were arrested and dumped in concentration camps. Police stood by and watched but didn’t intervene to stop the violence. Firemen attended but only prevented flames extending to neighbouring buildings when Jewish premises were set on fire. A lot of property was destroyed, which infuriated another leading Nazi, Hermann Göring. In his view, that property should have been seized. He decided it was time to bring anti-Jewish action under more disciplined control. At a meeting with Nazi leaders on 12 November, he announced that he had ‘received a letter written on the Führer’s orders requesting that the Jewish question be now, once and for all, coordinated and solved one way or another...’ To make clear that he really meant one way rather than any other, he demanded that the appropriate agencies ‘take all measures for the elimination of the Jew from the German economy’. From the elimination of Jews from the economy, the Nazi regime slipped almost inevitably towards the elimination of Jews altogether. The decision was taken in the end at the Wannsee conference in January 1942, and in consequence the final solution – in other words, extermination – went into effect. In other words, the problem isn’t with the people targeted but with the people doing the targeting. And, sadly, there are far more of them around than there should be after the experience of the Second World War. Despite my own Jewish roots, I’ve experienced no overt antisemitism. Until a year or two ago, I argued that antisemitism, certainly in Europe or the Americas, had shrunk until it was limited to a tiny number of fringe groups.. Islamophobia or homophobia struck me as far more widespread and far more acute. Today, I’m changing that view. We’ve had scandals about antisemitism in various organisations – including, sadly, my own party – and a failure to take action against it. Not acting on time is dangerous, as the case of Hitler after the Beer Hall putsch showed. The sores are festering, the disease is spreading. Nothing has made that clearer than the murder of eleven Jews in a gun attack on a Pittsburgh synagogue. Islamophobia and homophobia remain bigger problems. But maybe we can learn to oppose both of those and antisemitism as well. And what better time could there be for revitalising our commitment to the cause than the anniversary of Kristallnacht?